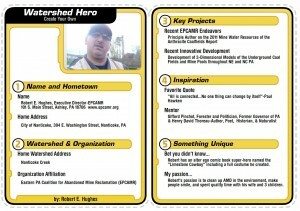 Submit your very own “Watershed Hero” trading card in honor of the work that you and other volunteers in your watershed have contributed to cleaning up your local environment and the AMD impacts in your backyard. Let no one go unnoticed. We would like to know: 1. About Our Hero (Full Name and Hometown), 2. Watershed (Home Watershed and Organization), 3. Key Projects ( 2 projects he/she is best known for), 4. Inspiration (Favorite Quote and Mentor), 5. Something Unique (2 unique qualities). Then upload a headshot photo from your computer and Voila! you have a trading card.